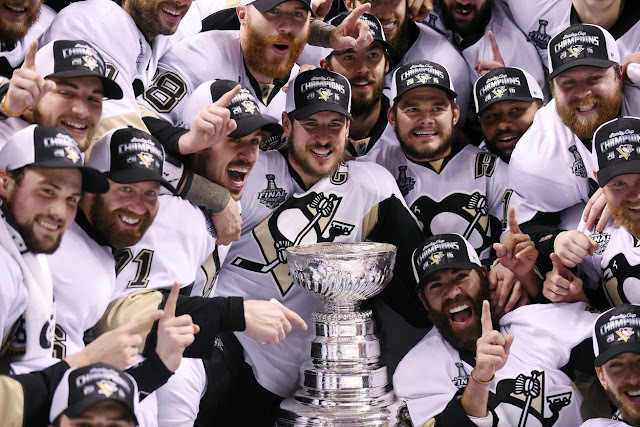 The Pittsburgh Penguins weren't supposed to win the Stanley Cup. They weren't supposed to be able to compete after the new regime limped to a five game playoff exit last year. They weren't supposed to win as Sidney Crosby and Evgeni Malkin's prime years came to a close. They weren't supposed to win after they came out flat to start the season, getting head coach Mike Johnston fired and ultimately bottoming out at a 15-14-3 record. They weren't supposed to win the Stanley Cup after a late season injury to Evgeni Malkin while they were still clawing to make the postseason. They weren't supposed to win, but the Pittsburgh Penguins are your 2016 Stanley Cup Champions for the fourth time in franchise history. The Pittsburgh Penguins weren't supposed to win their last championship either. They weren't supposed to win the Stanley Cup after they fell to 10th in the Eastern Conference standings and got Michel Therrien fired and promoted green WBS head coach Dan Bylsma to take his place. They weren't supposed to win after falling behind 0-2 against the Capitals in the 2nd round, and they certainly weren't supposed to win the Stanley Cup after falling behind 0-2 against the Detroit Red Wings in the Finals, needing to win four out of five games to lift the Cup, but the 2009 season ended with Sidney Crosby taking the Lord Stanley's silver chalice from Gary Bettman. The Pittsburgh Penguins weren't supposed to win either of these Stanley Cups, but they were supposed to win arguably every season in between. With their victory in 2009, the Pens behind Sidney Crosby and Evgeni Malkin were supposed to turn into a dynasty a la the Edmonton Oilers in the 1980s. Only, it didn't happen for so many years. The team had a 3-2 series lead against the Montreal Canadiens in 2010 with a chance to return to the Eastern Conference Finals for the 3rd straight year, but they ultimately fell short and it was chalked up to fatigue. The following season, with both Crosby and Malkin out with injuries, blowing a 3-1 series lead many thought they couldn't get in the first place was another understandable outcome. Starting with 2012, the pressure began to mount and it was harder for ownership and the fans to excuse away the playoff exits. Crosby's return at the end of the season vaulted Pittsburgh to Stanley Cup favorites, but they couldn't get past the Flyers in what ended up being a first round meltdown. They took the Eastern Conference's top seed in 2013, but managed only 2 goals in being swept by the Boston Bruins. They grabbed a 3-1 series lead against the New York Rangers in 2014 with a chance for a return appearance in the conference finals but again lost three straight to punch their ticket out of the playoffs. It was the last straw, and it cost both Dan Bylsma and Ray Shero their jobs. With the league ready to close the window on the Crosby and Malkin years in Pittsburgh, they busted right through with another championship, with credit to the work Mike Sullivan did behind the bench and Jim Rutherford and company did in adding talent to a team that hadn't been able to properly support their superstar centers. In came Phil Kessel, Nick Bonino, Eric Fehr, Trevor Daley, Carl Hagelin, and Justin Schultz. Conor Sheary, Bryan Rust, Tom Kuhnhackl, and Matt Murray provided a jolt of youth and enthusiasm from the AHL. And the team has a whole hit their stride late in the year and rode it to the a Cup victory. It just goes to show that hockey can be an unpredictable game, especially once the puck drops on the postseason. Pittsburgh's three best finishes in recent years have come from when no one expected them. Living and dying with each and every victory, having a Stanley Cup or bust mentality, just focuses on the pinnacle without enjoying the ride. When the Penguins won the Cup in 2009, big things were expected for the team in its near future. It's highly unlikely that anyone talks of a budding dynasty this time around, and maybe that's for the better. This team has always been best when they've been written off and had something to prove, and after what's felt like seven long years, they're finally cashing in on long expected Stanley Cup glory, and that's certainly made those years well worth the wait.